How could you not be reeling, Mary? I know I am reeling from the shock myself. First of all, I feel badly that somebody died, but really, Olive KNEW?? It makes absolutely no sense, unless Olive has some sort of INTUITION and a special CONNECTION! It really is the only explanation. Now let me make more animal faces with my paper cup. It looks like the man in the welder or HAZMAT suit may have dropped something in Mary and Drew's coffee. I love when Mary passes judgement, but in panel two, I'm having trouble figuring out if she's judging Dr. Kuphut, or Drew, or me. You're right Mary. It is unbelievable. But it isn't the first time you've been in an unbelievable situation. Holy Easy Peasey! It actually was the hospital heroin cabinet! It's a shame no one has developed a way to limit access and securely check who opens the cabinet. It might require some sort of technology, though, so it may not be worth it. Also, it's always fun to talk about employees after they've been fired, isn't it H.R. Department? H.R. Department? Are you there? Professional tip for the women in scrubs. When you hear a shocking rumor about a colleague, keep your exclamations (and exclamation marks) to yourself! Be more like Mary, and you won't find yourself keelhauled into a workplace discrimination suit. Please tell me the next four weeks will be a dual PSA: Olive teaches Mary how to set up an email account, AND Mary teaches Olive how to swim! Because I think I would really enjoy this. Is this what this entire story has been leading up to? 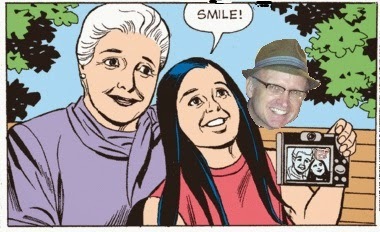 The opportunity for Mary Worth to take a selfie? There's something about this panel that reminds me of my father, who asked the doctor if he could keep my brother's placenta. He kept it for years in a jar of formaldehyde in his high school classroom. He was, and still is, an awesome teacher. I'm not sure how long Olive's torso cyst will last in her purse, though. "Now you can prove to us that you see flower fairies." Having spent more time than I like in hospitals this year, for procedures that were both easy-peasy and less so, I'd have to say the oddest thing about Mountview Hospital is how little business they seem to do. Seriously, where are the cars? I know they have tons of doctors there, but where is everyone parking? It's the Strange Life Smack Down! Toby: "I don't know about life... but ducks can be strange." Mary: "I don't know about ducks... but cysts can be strange." Toby: "I don't know about cysts... but parents can be strange." Mary: "I don't know about parents... but close connections can be strange." Toby: "I don't know about close connections... but lingering aftereffects can be strange." Mary: "I don't know about lingering aftereffects... but keeping on can be strange." Toby: "I don't know about keeping on... but keeping on keeping on can be strange." Mary: "I don't know about keeping on keeping on... but believing in yourself can be strange." Toby: "I don't know about believing in yourself... but flower fairies can be strange." Mary: "I don't know about flower fairies... but bad doctors can be strange." Toby: "I don't know about bad doctors... but double wide deck chairs can be strange." Mary: "I don't know about deck chairs... but intuition can be strange." Toby: "I don't know about intuition... but evolution can be strange." Mary: "Especially if you are more evolved than most people." Toby: "Tee hee, Mary. Tee hee." Thank you everyone for your generously kind comments regarding my story yesterday. I debated for two months whether or not I should share it, and I'm still not 100 percent certain I should have. I only wish I had incorporated the words, "without lingering aftereffects." But, really, the phrase never entered my mind. This is a rather redundant statement. Somewhat akin to: "Because of my car, I have a vehicle," or "Because of our large house, we have a domicile," or "Because of this comic strip, I waste a lot of time." "When someone gains my approval, Toby, they enjoy all the benefits that come with it. But they must be forever on their guard, lest they lose my approval and find themselves alone at the bottom of the pool. Olive has won my approval because she communes with the flower fairies. But, you, Toby... let's just say its been a long time since you've painted a clown." Instead of their usual denouement walk, Mary and Toby have set up chairs and an umbrella on a path at the beach, where they enjoy refreshing Agua® and apparently eat invisible doughnuts. Ironically, when Olive took a firm stand on Dr. Kupuht, she ended up stepping into deep water and almost drowning. I have to say, our family is really good about eating dinner together. But eating breakfast together? That must be something doctors' wives get up every morning to prepare. So that they can sit around with their coffee, and eggs and cereal, and talk about removing cysts and water in the lungs. It looks like Dr. Kapuht has taken to injecting bottles of Robitussin® directly into his veins. Because other than that, I can't think of what kinds of drugs would be stored in that sample cabinet. Of course, this is Mountview Hospital, so maybe that's where they keep their heroin. Don't tell her you're taking her to the doctors. Tell her you're taking her to the pet store. Then, after they cut off the cyst, give it to her and tell her, "Here, honey, here's your new pet." I'm just relieved that through our mobilization and thanks to the 37 people who signed our petition (17 were required -- way to go! ), Dr. Kapuht has been successfully removed from the Mountview medical staff. Thanks everyone for your help! It depends what your definition of "good" is. If you define this story as "good," then by all means, seeing flower fairies, receiving instructions from angels that you are inherently incapable of following, and getting a gut feeling that a doctor with a dubious name is bad, then yes, it's a very good thing. As of this moment, our petition to get Dr. Kapuht fired has 11 signatures! Only six more to go before we have the requisite 17!! Let's get Dr. Kapuht fired today! My daughter has strong feelings about a lot of things too, but we didn't buy her a purple pony. That would have been bad parenting. Even if the old lady next door had insisted. If Mary really believes in Olive's intuition, will she do the responsible thing and insist Mountview Hospital do a thorough investigation into his record and get the bad doctor fired? Please sign our petition by clicking here! It's about time that Mary got her meddle on! Woohoo! By the way, Olive's parents took advantage of the double wide deck chair that Charterstone had custom built for Ian Cameron. But who was this extra-long chair built for? I'd love it if there was a character who was so tall we never saw his head, just his torso. Hopefully, he wouldn't have a cyst on it though.